The Seastream Cone Meters are designed to offer high accuracy and reliable operation even in the harshest of subsea environments. 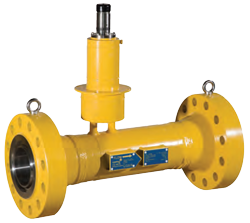 These meters offer a compact flow measurement solution, ideal for when space is limited. Each meter is designed for the unique project application, utilizing proven and robust engineering principles and can be supplied in a variety of materials to suit individual Operator Specifications. The introduction of the new in-head flow calculator removes uncertainty from integration into subsea systems, while reducing client software programming time. The ability to include a flow calibration curve within the calculation and can further enhance the accuracy of the Seastream. Close Coupled Diaphragm Seal Technology transferring the measurement closer to the process is available for gas applications, reducing the possibilities of hydrate formation. The Seastream is designed particularly for Well Management and flow assurance Gas Lift and Water Injection applications but can be adapted for any single phase application.